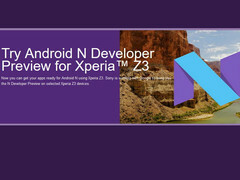 You can find this statement on the Google Plus channel of Zingo Andersen who is a developer at Sony Mobile. The reasons are technical and legal, as Andersen states. The Internet is abuzz with rumours: Will there be no Google Android 7 on any devices with Qualcomm's former high-end chipset Snapdragon 800 and 801? One of the reasons is Qualcomm themselves, as they don't provide new drivers for these chipsets. On the other hand, Google is also to blame: Devices that want to get the official update to a new Android version have to pass Google's Compatibility Test Suite (CTS). One new requirement in this test suite is that devices have to support either Vulkan or OpenGL ES 3.1, two new graphics APIs. Both are not being supported by Snapdragon 800 and 801 or older chipsets. That seems to be the reason why "older" flagship smartphones by Sony and other manufacturers are not able to pass the CTS and cannot get an official update. Google seems to be eager to make sure that all flagship devices support the latest 3D games and VR applications and these do need modern graphic APIs. Both the Xperia Z3 and Xperia Z2 should be powerful enough to run Android 7 and even most of the latest games. Android Authority's Gary Sims has another theory why Google doesn't want these flagships to be upgraded: Google might want to make device encryption a standard. The latest chipsets that are based on ARMv8 have the ability to encrypt files with hardware support. This is much faster than a software solution. To raise acceptance for encryption, Google might have taken measures to exclude older chipsets that are much slower at encrypting files. But didn't Google complain about slow upgrades to the latest Android version some months ago? Well it might just be that manufacturers and client are being put off by such frustrating decisions. One way to get Android 7 (and the latest security updates) is to get a CustomROM like CyanogenMod installed on your smartphone. With Sony devices that means, however, sacrificing also some software components like audio enhancement.